Desiree Linden approaches the 24 mile marker of the 2018 Boston Marathon on April 16, 2018 in Brookline, Massachusetts. 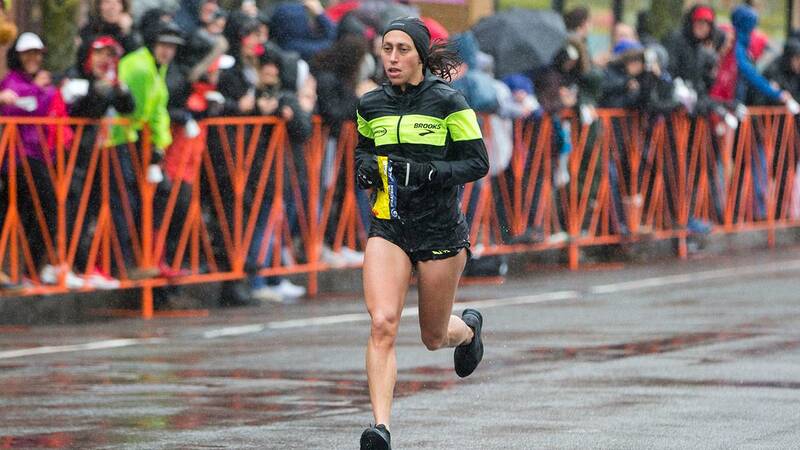 BOSTON - Desiree Linden splashed her way through icy rain and a near-gale headwind to a Boston Marathon victory on Monday, the first American woman to win the race since 1985. The two-time Olympian and 2011 Boston runner-up pulled away at the end of Heartbreak Hill to finish in 2 hours, 39 minutes, 54 seconds. That was more than four minutes better than second-place finisher Sarah Sellers, one of seven Americans in the top 10, but the slowest time for a women's winner since 1978. Yuki Kawauchi passed defending champion Geoffrey Kirui in Kenmore Square to win the men's race in an unofficial 2:15:58 and earn Japan's first Boston Marathon title since 1987. Kirui slowed and stumbled across the Copley Square finish line 2:25 later, followed by Shadrack Biwott and three other U.S. men. "For me, it's the best conditions possible," Kawauchi said through an interpreter and with a wide smile. In Copley Square, crowds thinned and muffled by the weather greeted Linden, the California native who lives in Michigan, with chants of "U-S-A!" Lisa Larsen Weidenbach's 1985 victory was the last for an American woman -- before the race began offering prize money that lured the top international competitors to the world's oldest and most prestigious annual marathon. Linden nearly ended the drought in 2011 when she was outkicked down Boylston Street and finished second by 2 seconds.